Ever tried to impress your crush by taking her to the bowling alley only to discover that the ball just wouldn’t stick to its lane? Sheer embarrassment, right? Well, possibly it’s not the bowling ball or the lane who’s at fault, rather it’s the way you throw is the real culprit. Bowling is no longer a recreational activity rather a popular sport across all ages nowadays. Throwing a bowling ball isn’t as easy as it looks but it’s no rocket science either. Knowing the right techniques will help to improve your game to a great extent. Along with the right techniques, having the right equipment is also crucial to ace the game. Let’s dig a little deeper and see how you can throw a bowling ball to rock the bowling alley. Take some deep breath before starting the game. Flexibility is really important when it comes about bowling. Also, learn to adapt. You might be a pro at your local bowling place but remember not all bowling alleys are same. The lanes are oiled so bear in mind that the oil content is not the same in different lanes. So, adapt and improvise. There’s a common misconception that a heavier ball will provide a better outcome which is entirely wrong. Heavier bowling balls will make you fatigued after a while and put a strain on your wrist. Also, an extremely light bowling ball might swerve off the lane. So, pick the ball that you’re comfortable throwing so you can knock the pins off at a single go. Check our guide to know about the best bowling balls for beginners. The finger holes need to fit you well to have a good gaming experience. The finger holes should be too big or too small, it needs to be just about the right size otherwise you might end up delivering a sloppy performance. If you’re throwing the ball through a straight alley then visualize an imaginary line from the center of the lane. Don’t focus too much on the pins, rather gently glide the ball along with this imaginary line to make that perfect hit. Also, position yourself little to the side of the lane to get the ball in the middle of the alley. When you come at the bottom of the swing, keep the hand and wrist behind the ball. Be noted that if you break your wrist at the bottom it will cause you to release the ball and will not provide much hooking. A good bowling ball is an inevitable part of a good game. For a starter, you need to find a bowling ball that suits you the best. Don’t go for a ball that’s too heavy or too light. Try to figure out the best-suited one for you through trial and error. Timing is really crucial for a good start. Your hand and leg movement should be in sync for the perfect throw. Keep your hand and wrist in a firm position throughout the shot. If you’re going for a hook then turn the wrist and hand as you take the ball forward from backswing. If you’re going for a straight hit then make sure your hand and wrist are straight during the release. A timely throw along with a good posture will help you land a perfect throw every time. 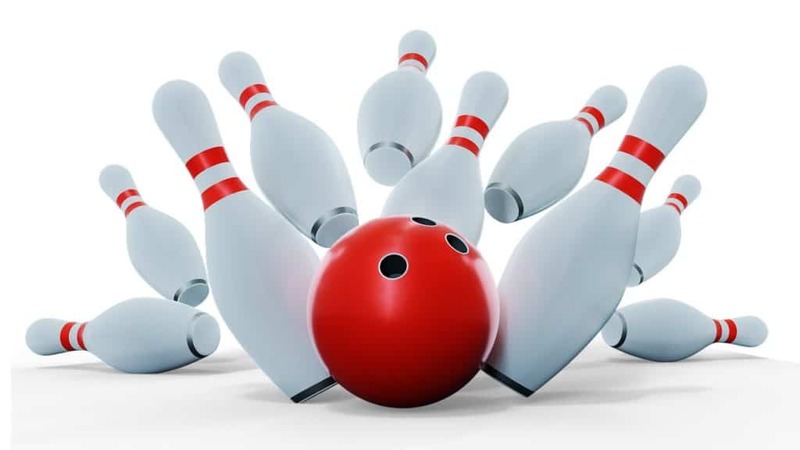 A strike is when you take down all the ten pins with one throw. Double is the term used when a bowler lands two consecutive strikes and Turkey is the term used if the bowler hits three strikes in a row. A bowling pin needs to be 15 inches tall and a maximum of 4.75 inches width. Remember that the pin should not weigh more than three to four ounces. Bowling balls are made with different materials such as plastic, urethane or resin. A bowling ball has three holes where you can place the thumb, ring finger, and middle finger. Bear in mind that the ball should not weigh more than 16lbs. Bowling is a fun activity and people of all ages can take part in this. Bowling has very simple rules to follow and you don’t need to break the bank to buy the equipment as well. Throwing the perfect hit requires practice. You can learn the techniques as well as well your flaws with time through trial and error. In this article, we have gathered up the basic rules that you can follow for a wholesome game. So, get your gears on and rock the bowling alley!